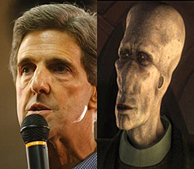 John F. Kerry, Democratic Presidential hopeful, was, unknown to most fans, a bit character in the last Star Wars movie Episode II: Attack of the Clones. He played San Hill, Chairman of the InterGalactic Banking Clan. In the movie, Kerry's character joined the Confederacy of Independent Systems on Geonosis, but only committed his forces in a non-exclusive arrangement. "Kerry is a natural," commented George Lucas. "He'll be in the next movie whether he's President or not." Makeup artists raved at how little they had to do to fix him up. "All we had to do was apply a little blush and put on a fake bald cap," said Jenny Goop, lead makeup artist. "His hidden hair made the fake head taller than Lucas wanted, but it worked anyway." "George [Lucas] told me to say anything I wanted to in the scene because they were going to impose another language anyway," recollected Kerry. "So I ripped a cursing tirade against Bush that had everyone in stitches. I think it's on the DVD uncut." It's believed that Kerry is behind this news just now coming out as a strategic ploy to gain younger voters in order to win the primary. Howard Dean was also in the movie-as a screeching Tuscan Raider.